I am not a winter person. I don't like being cold. Sure, I love the crisp autumn leaves, snuggly jumpers, being cosy inside while it rains outside, but in between all that, it's just not my season. I'm a summer baby through and through and one of my bad habits that gets triggered in winter is junk eating. We're talking always wanting hot meals, stodgy dishes, carbs, cheese and salty fatty foods. I'm pretty sure there must be some genetic reason for this, fattening up for winter and whatnot, but, while it might feel great at the time, all this ends up leaving me feeling more sluggish and lethargic. So it's time for me to whip out my favourite recipe books and eat myself through winter in a much healthier way. Meals can still be hot, stodgy and carby, they just don't have to be chockablock full of all the crap. My three go-to recipes books are all well within the 'healthy lifestyle' category and are all chosen for their real, down to earth and feasible recipes focusing on a balanced eating (note no use of the often misused word 'diet'). There's a few books within my stash that are just not designed for the average person with a typical lifestyle, full of recipes with ingredients that have to be sourced from places like outer Mongolia and cost a years worth of wages (yes, I'm looking at you Gwyneth Paltrow) but these three are tried and tested for even the busiest lifestyle and tightest budget. I'm not really one to be running out and buying all the Youtube merch (no shade!) but I've been following Niomi since she transformed her diet and have always enjoyed her recipes and food videos. So when Niomi released this book a few months back I thought I'd give it a shot. This recipe book is vegan /plant-based and have a lot of great recipes that really are easy, quick and pretty delicious. Some recipes aren't that different from in other books, but they mostly have a new twist on them that I like. Sometimes the recipes are simpler and more suitable to my life with ingredients that I can get hold of more readily. The best part is that there are a lot of hearty warming dishes which is ideal for me in the winter. The first book released by Natasha Corrett. This book is my slightly 'fancier' recipe book, in here there are dishes that require a little bit more sourcing of ingredients, and a bit more pre-planning and I'll go to this if I have a bit more time to 'prepare' a meal rather than 'rustle up' a meal. This book is different in that it is focused on an alkaline diet, balancing out the PH of your body especially your digestive system. It is mostly plant-based but not vegan as it includes cheese and eggs in recipes. Honestly Healthy provides a lot of pre-information on nutrition and digestion, ingredients, portion sizes and food combining. It's ideal to understand why the meals are made up the way they are and why/how they benefit you. 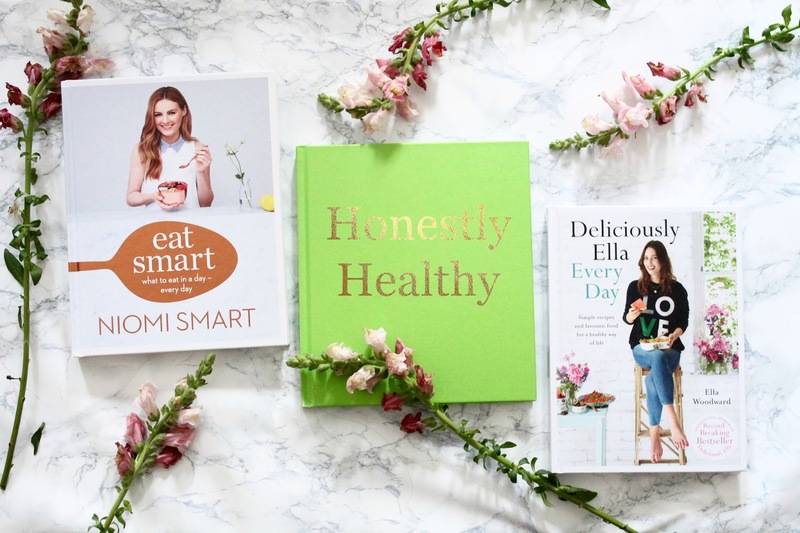 I'm keen to get more of the Honestly Healthy books to see what other recipe gems they offer! NB: I've had this book for so long that I've lost the cover slip so please excuse the cover title embellishment that I added post-production! This is Ella Woodward's second book. I have her first which I love and bought based on her amazing blog. While the first book was a fantastic introduction to her style of vegan/ plant-based eating and provided in-depth tips and guidance on ingredients, food storing, cooking and prep, this one is more recipe packed. The recipes in the book are much more applicable to a busy lifestyle and again provide satisfying and easy to make recipes that also consciously avoid gluten as well as all animal derivatives, products and by-products. I would recommend both books! My top advice for using any of these books, is firstly go through and make a list of all the dry goods and staples then do a huge order. It may be expensive for this one shop, but things like rice last a long time and the cost will be justified over time when you're not having to repurchase staples repeatedly. Secondly prep, set aside and hour on a Sunday of Wednesday and pre-chop and cook up the building blocks of dishes you want to eat in the following days. Once you do it enough it will soon become routine and habit and you'l be whipping up dishes in no time! All of these books actively avoid meat in the recipes but if you do feel the need to add meat, it would be easy to do so to any of the recipes. There's a few other books that I've got my eye on and on my amazon wish list including: The Healthy Life by Jessica Sepel, Get The Glow & Ready Steady Glow by Madeleine Shaw, Clean Eating Alice The body Bible by Alice Liveing and more! If there's any of these you think are a must have let em know, or suggest others I might not know about! BLACK FRIDAY SALES WITH LOVELULA!